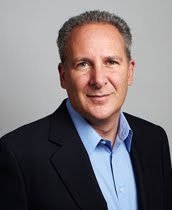 Peter Schiff is the president of Euro Pacific Capital and a 2010 Republican candidate for the U.S. Senate seat currently held by Democratic Senator Chris Dodd. He was an economics adviser to Ron Paul during his campaign for president. The first of these videos is his blog from 4 April where he responds to the ABC interview with Alan Greenspan on their This Week Sunday program. He blames Greenspan for promoting the bubble that ultimately led to the financial meltdown. He was appalled by Greenspan's denial of responsibility and for saying that hardly anyone saw it coming and that those who did were just lucky. He challenges Greenspan to a debate on the subject. The following videos are clips of Schiff predicting the meltdown way back when everyone else dismissed the possibility. I think this guy deserves our support for his election bid at least as much as Scott Brown did. The information in this last video sounds like common knowledge now, but keep in mind, Peter made this very prescient speech in 2006.